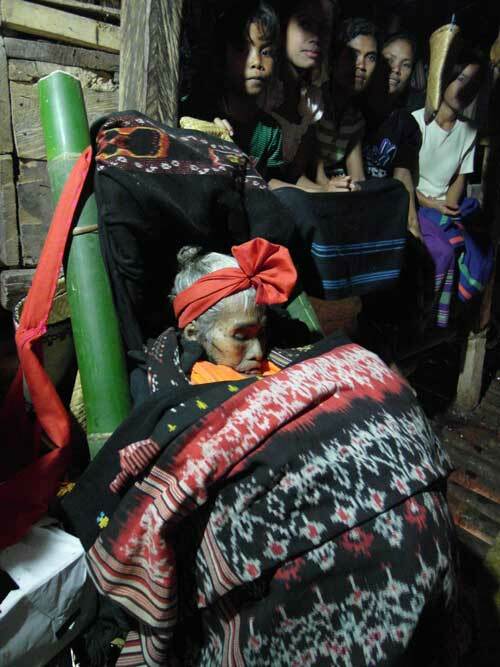 “Taking Tea with the Dead” — the working title of the book I’m not quite getting around to writing — was taken from an experience over 20 years ago, when I was invited in to meet the grandmother of some random villager in Sumba. I was a little put out, on being introduced to Granny, to find that she had died the day before. I picked this piece of exotica as my working title because I was pretty sure that I would find, revisiting these parts two decades later, that such esoteric traditions would have disappeared. Tea with the Dead would surely have died, swept out of Indonesia on a homogenising wave of modernisation. The title would reflect the changes in the country, and perhaps, in a self-centred sort of way, my nostalgia for something that was no more. Not at all. When I went to visit my friend Mama Bobo the other day to arrange our outing to the pasola jousting, she was in a tizz. Her sister-in-law had died the night before. Now she had to scrape together weavings, pigs, buffalo and endless supplies of betel nut to contribute to the week of feasting that precedes the funeral. Of course I must come along (this would entail some scraping together of my own, for every guest must pay tribute). And so, 22 years after I first took tea with a dead Granny, I repeated the ritual. Which rather calls in to question that homogenising wave of modernisation. Though Granny slept through it, the remainder of her terrestrial existence was quite bloody. For the less squeamish readers there will be more, much more, in the book. Whatever it is called. Enforcement of this law would depopulate the island. 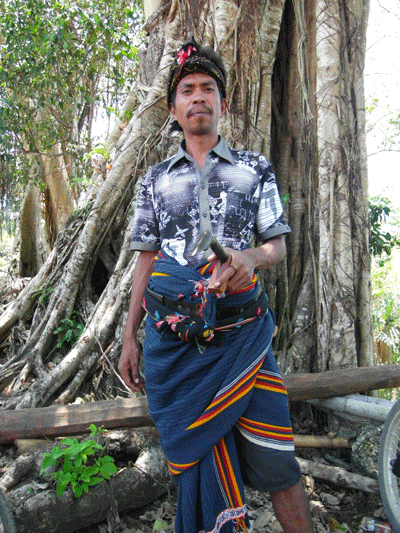 No self-respecting man in West Sumba is without one of these parangs; they are a core element of ceremonial dress, and in the last week I’ve seen them used to slaughter pigs, skin a horse, clear land, prune trees, whittle musical instruments, even sharpen a pencil. But they are also used to make trouble. The first time I arrived at this same airport, Tambolaka, a local doctor gleefully showed me a photo on his hand phone of a body hacked up in the market in Waikabubak, West Sumba’s main town. “Look, that’s his hand, lying over there…” Local ceremonies in which conflict is ritualised — the pajura group boxing contest, held on a beach by the light of the moon, the pasola jousting war, which sees youngsters on galloping horseback sling spears at one another — sometimes turn nasty. At both of these ceremonies last week, young men were barred from carrying their parangs. Just as well; the Wanokaka pasola degenerated into a glorious riot of chest-puffing and stone-throwing. A few people and a police car got badly bruised, nothing more, but had the young bloods had their parangs on them it might have been nastier. 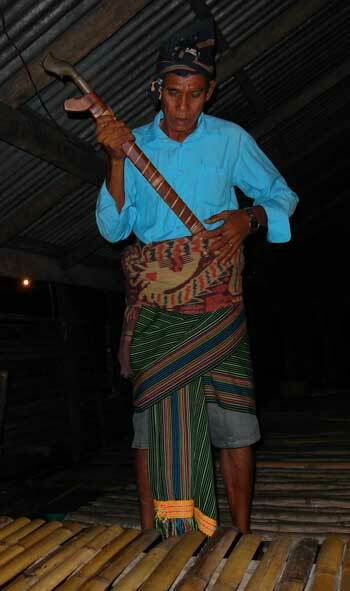 Their elders, including Bpk Petrus, pictured below, still get away with wearing their weapons whenever they please. But it does raise something of a problem in areas of Indonesia where the carrying and use of potentially dangerous weapons is common. The police can hardly enforce the law selectively, and if they try to enforce it universally, their efforts will be slashed down by the custodians of culture as well as by the farmers and labourers who rely on their parangs for tasks large and small. For my 30th birthday, my mother framed school reports from the time I was 12 or 13. “Elizabeth is far too fond of the sound of her own voice” and “she sometimes sails too close to the wind for comfortable passage in the flotilla.” Are we really set in stone by the time we reach our teens? 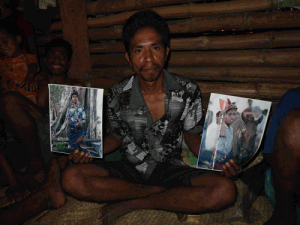 I had cause to wonder this week, as I wandered West Sumba in search of people whose photos I had taken 20 years ago. 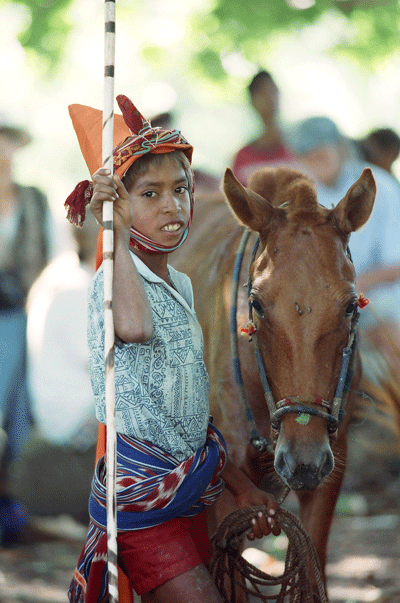 One of my favourite pictures was of a young boy dressed up for the pasola jousting festival. He was too young to take part, but that didn’t stop him challenging the camera with a “you wait, I’ll show you” sneer. Showing the pictures at a friend’s house, some one piped up: that’s Pelipus. That’s our Kepala Desa. 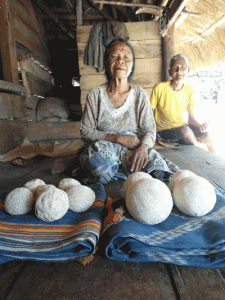 The kepala desa, or village head, is now an elected position, arguably the one that has the most influence on people’s day to day lives in remote rural communities such as Gaura, where we were at the time. We went off to find Pelipus; he was preparing for the ceremony that marks the negotiation of a dowry. It starts with reading the entrails of a dog (provided by the bride’s side), to determine whether the partners are well-matched. The groom’s side is secretly hoping for bad omens, not necessarily because they want to see an unhappy marriage, but because a bad prognosis brings down the dowry. There’s no point holding out for too many buffalo if you’re going to have to return them when the couple divorces. Second order of business is to slaughter and roast a pig (also from the bride’s side); no serious bargaining can take place until everyone has eaten their fill. So Pelipus was busy, but not too busy to have a look at some old photos. The party oohed and aahed over pasola heros past and present. And then the village head found himself on my iPad. That “you wait, I’ll show you” look is still there, though when I bumped back along the 15 kms of unpaved road the next day to give him the prints of the “Then and Now” photos, he was looking a little the worse for wear — the dowry negotiations had continued until dawn. He and his companions had bargained a starting offer of 15 cattle up to 40 head of buffalo and horses. It would not surprise me one bit to come back in another 20 years and find that Pelipus is head of the West Sumba government. 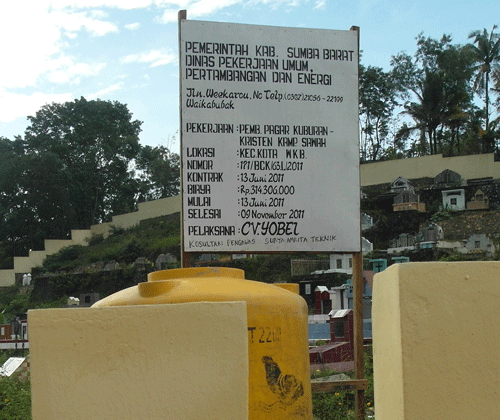 Sumba is a graveyard of bodies and good intentions. 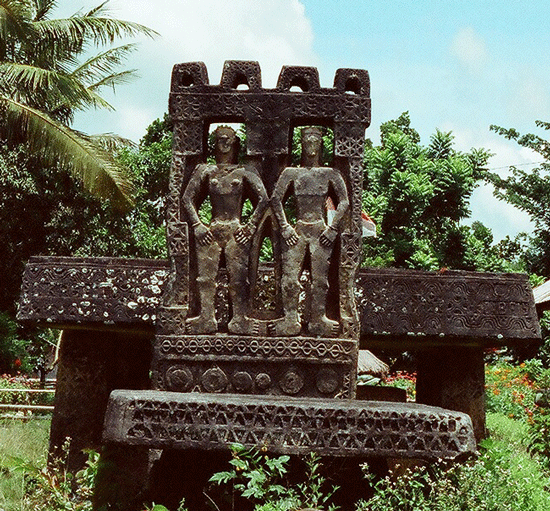 Physically, it is littered with impressive megalithic tombs and their hideous modern counterparts. Financially, it is littered with development projects that haven’t quite developed anything. “Megalithic” sounds ancient, and many are, but they are still being built today. The tomb in the photo above was built in the 1970s; it took several hundred people the best part of a year to drag the stones on wooden rollers from the quarry to the burial site, and months more to carve. It’s “voluntary” work, but workers need to be fed, and richly. That makes for a lot of dead buffalo. No huge surprise that many people are now using cement and tiles. 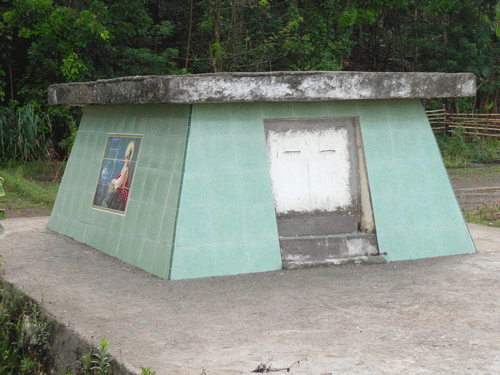 Since the tile-piles have doors in them (to make it easier to shove family members in as they die) the island looks increasingly like a repository for surplus public loos, though some families are prettying them up (and covering their bets) with pictures of Jesus. May everyone rest in peace.